Founded in 2012, LSBet has already managed to make a serious name for itself within the betting world. With a lot on offer from bonuses to content, there’s certainly no shortage of exciting things to explore. On first impressions, LSBet comes across as a very conservative site, at least in terms of design. It’s spacious, simplistic and easy to use, but it can also be argued that it lacks personality. While you can navigate the website with ease, we would understand if people using it were concerned that it looks a little amateurish. That being said though, the amount of content you can see at first glance – as well as an opening selection of promotions, including a 50% welcome bonus – suggests that this may very well be the real deal. So, is LSBet a bland, basic site as suggested by its minimalist design? Or is this the look of a site that’s all about practicality and creating the best possible user experience? Let’s take a closer look to find out. If there’s one area that LSBet certainly doesn’t scrimp, it’s promotions. In fact, because of the sheer number available, we won’t be able to cover everything here. So instead, we’re going to pick three bonuses available at LSBet at the time of writing to give you an example of the type of quality that is on offer. Do keep in mind that these are not inclusive of all the terms and conditions, merely those that we thought were most relevant to the reader. Also note that the country of residence can affect terms and conditions, as specified below. Please check out the site yourself for more details. 50/100% Welcome Bonus – Well, we couldn’t start anywhere other than the welcome bonus. Firstly, 50% isn’t a massive amount, with plenty of sites offering 100% bonuses. However, with reasonable minimum odds of 1.5 and a rollover requirement of only 1x, there’s not many that can match their terms and conditions. The minimum deposit here is 1,000 RUB, with a maximum of 2,200 RUB. For players in Europe and the United States, the maximum is 120 dollars or euros, and the bonus percentage is 100%. Reload Bonus: This is a time sensitive offer, allowing you to get a 20% bonus up to 100 euros or equivalent, which will be credited to a free bet. One bonus is available each promotional day and the minimum odds is 1.50. The minimum qualifying rate is 25 euros or equivalent. Cashback On Your Mobile: This allows you to receive cashback of 10% on your losses up to 350 euros, with a minimum cashback amount of 10 euros or equivalent. This can only be played in the sports section and can be obtained via a request to customer service. These are just a few examples and while we suppose there are more creative bonuses out there, you can’t deny the quality and value available in LSBet’s promotions. Just like the site itself, the focus is on practicality rather than gimmicks. The only thing we would say is that the amount of sports options really does dwarf the casino promotions, so we’d like to see the latter play a little catch up there. As we’ve already alluded to, LSBet is not short of content. In terms of sports, all the usual suspects are here, including e-sports and entertainment. Although it is lacking in some niche sporting corners, we think that in general, most will be satisfied with the options here. The focus though is clearly on football with various leagues like La Liga, Bundesliga and the Champions League all being displayed prominently. 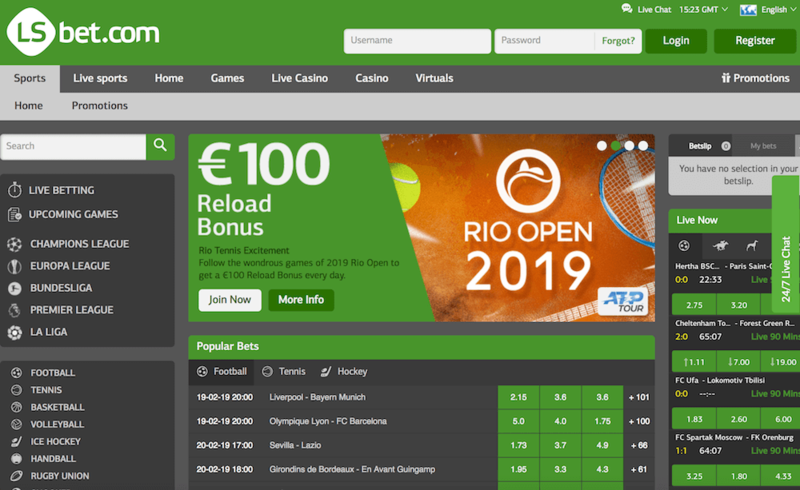 There’s also plenty of live betting options, and although the casino may lack the promotional punch of the sports side of the site, it is certainly not lacking in content. It boasts high-quality slots, as well as live games, including blackjack and roulette. Considering that we’ve already sung the praises of the functionality of this site’s design, you would probably imagine that this translates well to mobile – and you would be correct. Although there’s no LSBet mobile app available, this site works great on both mobile and tablets devices. Everything is about as easy to use as it is on the main desktop site, with all the bells and whistles – at least that we could see – being present and correct on this shrunk down option. Unfortunately, there’s no live streaming of sports at LSBet at this time, although there are live dealers available via the live casino. In terms of virtual sports, the usual bland backgrounds are here but, once again, LSBet excels in usability with a very deep and diverse set of virtual sports options. This allows you to really get invested in this alternative to the normal sports betting experience. Here, you’ll have an event ticket, live scores and even live league tables all helping you to immerse yourself in a compelling virtual world. Here is a rare case of LSBet falling below our expectations. We were informed by the customer service that payment and withdrawal methods depend on the individual country and that the minimum and maximum amount depends on the individual payment method. In terms of specifics, we know that the website does not impose fees or taxes on either deposits or withdrawals. We can also see that the various payment options include debit cards, Skrill, Neteller and more. We understand that, as a site which operates in 20 different countries, the amount of information required from LSBet to cover every user is massive. However, we do think more could have been done here. At least account verification remains the same across the board, with ID in the form of a passport, driver’s license and things like utility bills being accepted. One area in which LSBet really excelled – at least during our experiences with them – was in their customer service. We found them to be quick, responsible, friendly and, most importantly, informative. While we certainly can’t speak for everyone’s experience, it does appear from our research that plenty of other people also found this to be the case. When you consider this alongside the fact that their service is available 24/7 and also includes email across 11 languages, then we only really have positives things to say here. LSBet is licensed in Curacao with the license being held by Media Entertainment N.V. They also utilise SSL technology to keep users’ data safe. Just as important though is the customer and critical feedback, which seems to be overwhelmingly positive, with praise being heaped on everything from their odds to game selection. One of the best ways of assessing their reliability is through their consumers, and although you’ll rarely find a single betting site without complaints, we’d say that the critical reception is more positive than negative based on our research. Casino fans will be happy to hear that they are also rewarded with a welcome bonus at LSBet. This is similar to the sports Deposit Bonus, although it’s a 100% bonus all around this time. It also comes with a much heftier – although still very competitive – 25x rollover requirement. The minimum deposit is still the same, and the maximum is 20,000 RUB. For players in Europe and the United States, the maximum is 300 dollars or euros. While it is clear that LSBet lacks the polish to make it one of the best betting sites out there, it still manages to do a lot of things very well. On top of that, the areas it chooses to focus on – such as the variety and quality of content, and excellent customer service – are among the most crucial. We do think it could a little bit of tidying up in places, especially with regards to their deposit and withdrawal information. Plus, a few more casino promotions wouldn’t go amiss to make them as strong as the sports offering. Overall though, LSBet does an awful lot more good than it does bad. It’s easy to use, high quality and with plenty on offer. 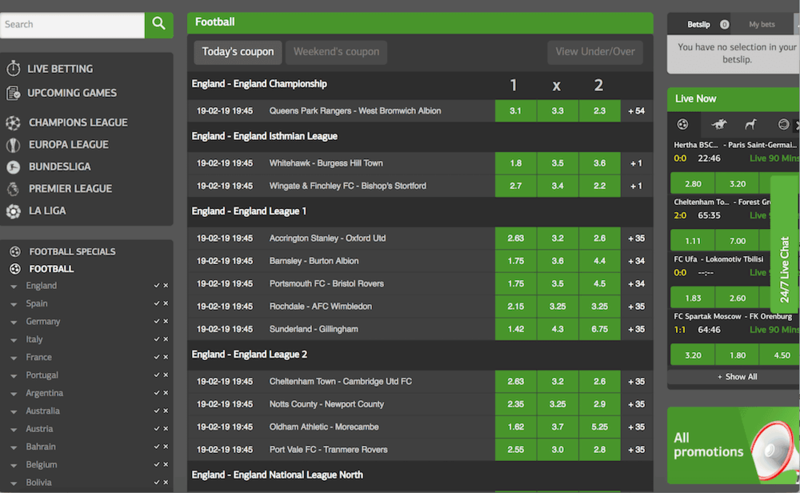 While not quite great, LSBet does fall comfortably into the very good category of betting sites.